Two weeks ago (can that be possible already?! 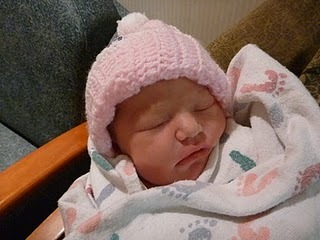 ), our family welcomed a new sweet little girl! We love her tremendously already. Love the rainbow analogy, never heard that before! She is gorgeous! Enjoy spoiling her Auntie Dev! Holding the "Rainbow" analogy close to my heart! Sooo glad Aim could have her own "Rainbow" baby! She's perfect and sooo cute! LOVE names rich with meaning--this one especially! Each of our three also have special meanings behind their names. I don't know how you do it! Mine are almost 4 yrs. old, 2 yrs. old, and 8 mos. (The 8-mo-old is starting to pull up to stand now too, just like Lola!) and I have my hands full with just three. Someday we hope to have one more, but maybe a little more space between them this time since pregnancy = bedrest for me. Becky--Oh, I am so sorry if this post gave the wrong impression! This is my niece, not my own! Tears. Seriously. She is beautiful.